Prized by cooks and diners, sea scallops are considered by many to be the most appealing of the shellfish. The premium products among scallops are the largest specimens, which have a delicate flavor and tender texture. Scallops are at their peak flavor when fresh, but may also be frozen. Scallops are bivalve mollusks. Various members of the scallop family are found worldwide. The edible portion is the adductor muscle of scallops. The muscle is larger and more developed than most shellfish because they are active swimmers. Scallops can swim by rapidly opening and closing their shells. This method of propulsion is used as a escape technique when threatened. Scallop shells are symmetrical, attractive and highly collected by sea shell enthusiasts. Scallops are prepared in a variety of ways. Their delicate flavor and texture allow for a variety of cooking methods. They can be easily breaded and fried, sauted, broiled or used in seafood soups, stews, chowders, or salads. One of the most popular recipes calls for scallops to be wrapped in bacon, then broiled. The scallops’ versatility in taste lends itself well to various cuisines from around the world. 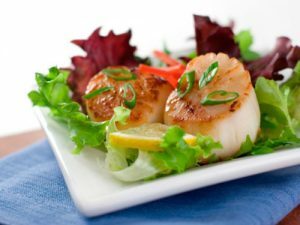 In addition to American dishes, sea scallops are a frequent ingredient of Asian, Mediterranean, and South American cuisine. Scallops and scallop roe are used in sashimi and sushi dishes. Sea scallops are sold by size. Counts are expressed as a range. Large sea scallops are sometimes designated by the letter U, which stands for “under” followed by a number. The smaller the number, the bigger the scallop. One bushel of sea scallops yields approximately 3.5 pounds of meats (adductor muscle only).